Organic Wines – say the term and you'll get a wide array of reactions from derision to fanaticism and every step in between. The growing push in the food industry for natural products hasn't missed the wine industry. A number of Wineries have taken steps to partially or fully embrace natural growth and production of their product with some taking it a step further having had their practices certified. Most wine consumers are aware of fruit or vegetables that are certified Organic but there are several other certifications that are available to Wineries in addition to Organic including SIP (Sustainable in Practice) and Biodynamic. Given the wide disparity on Winemakers opinions about Sustainable practices, it's virtually impossible to garner a consensus on the overall effect that sustainable practices have on the wine. The only thing that is certain, is Organic Wines and Organic Wine products (Vinegars, Preserves etc) are here to stay. The possible entries for this Field are Sustainable in Practice, Organic, Biodynamic and None. 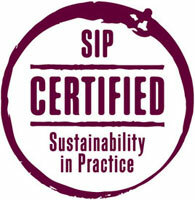 For a listing of Organic Wineries, Biodynamic Wineries or SIP Certified Wineries, click the button below. Once you have been taken to our Winery Database, narrowing the search further by filtering on the “County” field saves a lot of work looking through wineries that aren’t in the right area.